It was my final day in the Algarve. I would be leaving the next day for two weeks in England where the temperature is 14 degrees rather than 34 and where something called ‘rain’ is still occurring with frequency. So, what better excuse for a full day out on the bikes. 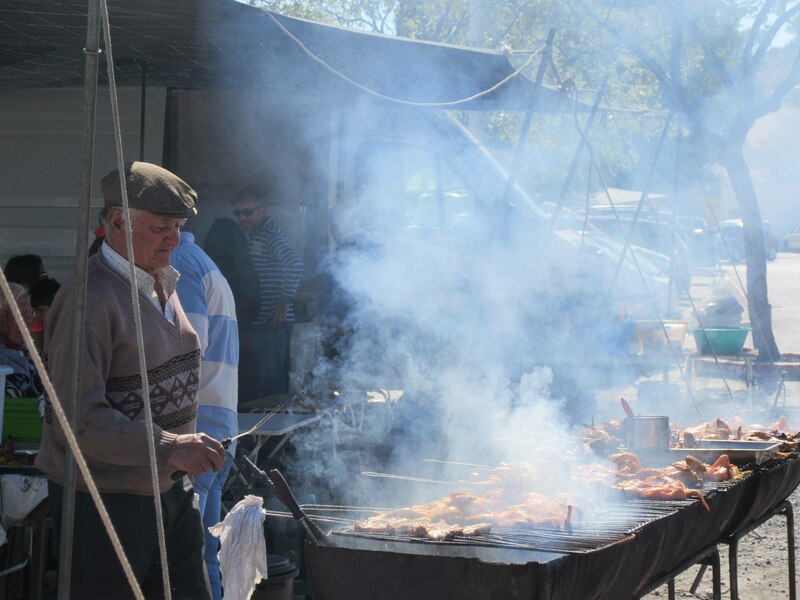 The 2nd Saturday of the month is Castro Marim market day, which is not vastly different to any other monthly market in the Algarve, but we particularly like Castro Marim; for its sleepiness, castles and the fabulous Medieval Days festival which take place each August. I am always astonished how such a small and sedate town can pull off such a brilliantly orchestrated event. 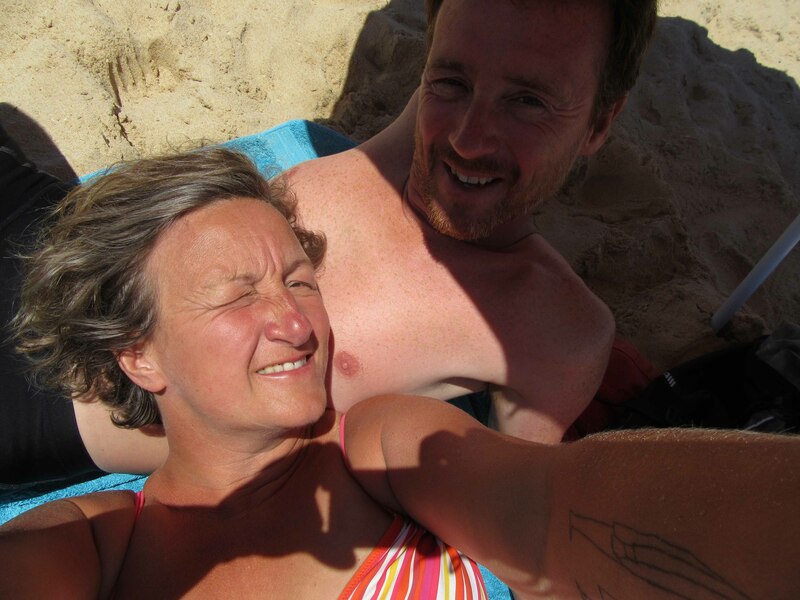 We set off later than usual, as always full of good intentions and commitments to getting going before it gets too hot, but perpetually fail due to idleness, morning swims and lazy breakfasts on the terrace. It’s easy to slip into a slow pace of life when everything is just so damned good. 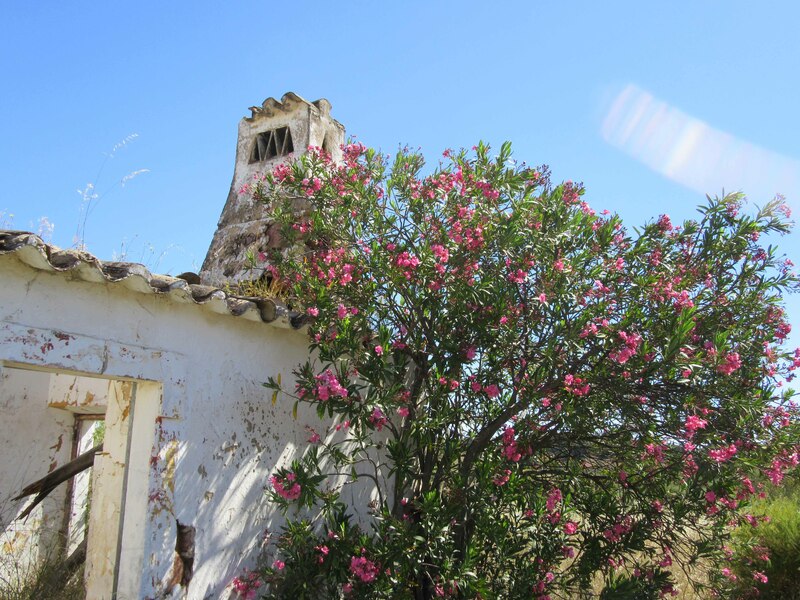 We have recently taken to Instagram and so nowadays our every journey is punctuated by photo stops, where the ruined cottage is particularly picturesque and the flowers especially cascading. The usual route of choice is the Ecovia, a favourite place to cycle across saltpans and through quiet fields and trees, but today we are mavericks and took a turn off the N125 past Altura into the hinterland of Sao Bartholomeu towards Azinhal to sneak round the back, cut the corner of Vila Real and emerge in Castro Marim. It’s a lovely stretch of road for a bicycle – some undulation but nothing too painfully hilly. Whilst Keith loves the challenge of altitude with its steep climbs and death-defying downs, I prefer a more moderate terrain – too flat is dull and too much up and down is equally tedious. I’m not made for hills: I’m a plodder, a shire horse of the cycling world that can go on forever but not at great velocity. Due to our typically tardy departure, we fortunately arrived in Castro Marim in time for lunch, which in the market is restricted to the limited menu of olives, bread and chicken straight from the grill. Although we eat little meat at home because we don’t feel the need, we have yet to take the full plunge into the veganism we feel to be a better way to live. To be honest, the existence of grilled chicken is not helping. We make verbal justifications about ‘protein’ and ‘energy loss’ due to cycling and we sit back and tuck in. I think I love this place because it reminds me of Morocco, which I also adore and almost lived in. 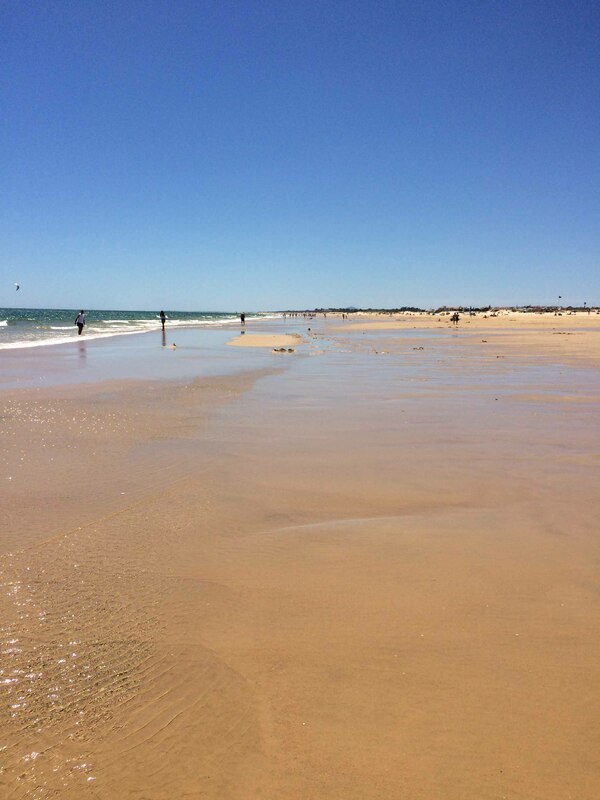 Whilst taking in the smells, sights, singing and general atmosphere, we talk about how maybe, just maybe, the Algarve really is the perfect place for us. It has all the best of Europe with a dash of Morocco. We ponder whether we really could make the move further north, as we sometimes threaten to do in search of more (affordable) land and rain to make the growing easier. That’s for another day. Today we are glad to be here. And then it is time for the beach on our meander home. The Eastern Algarve coastal stretch from Vila Real to Manta Rota really feels like a secret. I almost expect people to be whispering and tiptoeing around, just in case anyone else should get wind of the place. Today we stop at Altura and its beach, Algoa, but anywhere along here would serve us just as well. The sand, the sea, the long, long convivial lunches in the seafood restaurants; the mood is peaceful rather than hectic. Having transported our parasols in our panniers like masts this far, it’s time to set up camp on the sand for a snooze and a swim and to make some vague post-lunch plans about 2 month cycle rides around Portugal and lengthy trips to the Azores. Everything feels possible today. Home beckons as I have to pack and the garden needs a watering, so off we pedal; a little sandy, a little sore and a lot tired. We have covered 60km in the heat, sometimes helped and hindered by a strong northerly wind. The final 10km are the hardest; the climb back up into the hills is too much for me at times. I send Keith off to make his way home at his own pace and I walk and freewheel my way back, enjoying it all in the isolation of the empty serra roads. It seems that today I may have enjoyed myself for too long because as I made my final approach to Casa Torta, I was met by Keith coming the other way in the car, having become worried about my extended absence, he having arrived home 15 minutes before. I don’t know what he was worrying about, I was getting there. Maybe he needs to chill out a bit.